This staple decor item is taking on new, modern shapes and styles designed to excite. Tiles are a staple of bathroom decor, and the options for how to use them are endless. This year is seeing plenty of new tile trends emerge that cater to just about every design style, from minimalist to maximalist. 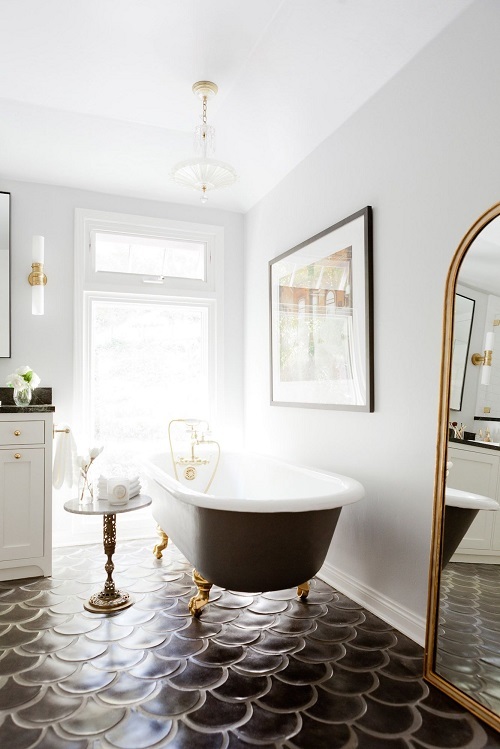 Swipe up for ideas to inspire your next bathroom renovation (and as your tile obsession grows, check out these kitchen tile ideas, too). Gone are the days of tile floors blending into the background of a room. In 2017, you’ll see the reemergence of patterned tiles, perhaps reflective of this year’s renewed focus on artisanship and craftsmanship. If 2017 could have a shape, it might just be honeycomb. Designers are getting geometric with their tiles, with honeycomb (aka hexagon) shapes appearing in tiled flooring and walls. 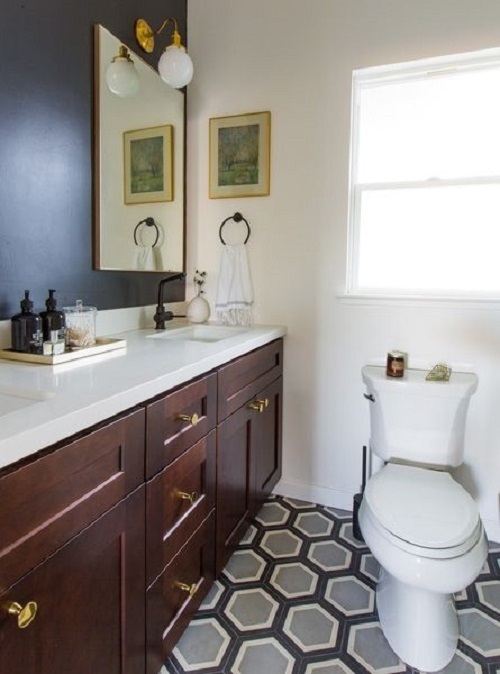 This bathroom from Laurel & Wolf features gray floor tiles with navy borders, which echo the navy blue wall. Patterns painted on tiles aren’t the only way to excite with tile. 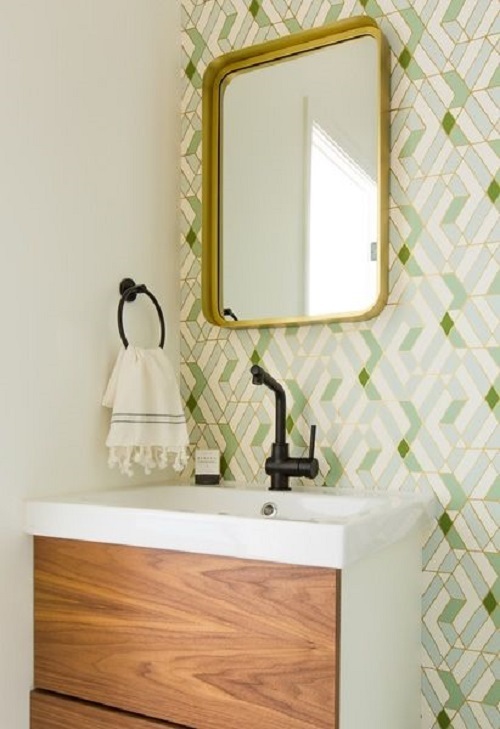 Designers are piecing together intricate designs using a variety of colorful, geometric tiles meant to capture the eye upon first glance, such as in this bathroom in a Laurel & Wolf home. Though color will certainly be trending this year, so will earthier tones such as chocolate brown — a sound option for those who prefer a more neutral palette. In this Homepolish home, the floor tiles are a deep brown that add dimension to the neutral space. You can also expect matte finishes to compete with glossy this year. If the honeycomb tile trend is any proof, this year will be all about atypical tile shapes. 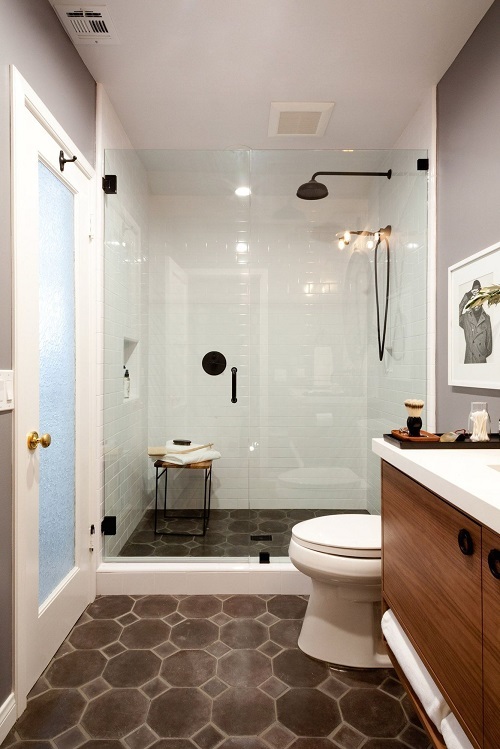 Instead of the classic subway tile, this year, long and narrow tile will appear in bathrooms as a sleek alternative. The fish scale trend first emerged in 2016, but it’s still reigning strong into 2017 with fashionable bathrooms like this one from Homepolish. Fish scale tiles add an element of dimension and offer a softer look for the homeowner who wants to avoid a boxy look. When you’ve tired of horizontal subway tile, the only place to go is — up! Vertical tiles can be staggered for an unexpected, modern aesthetic that can visually expand a room. This particular bathroom uses varying shades of gray to capture visitors’ attention. Naturally, 2017 is all about green. 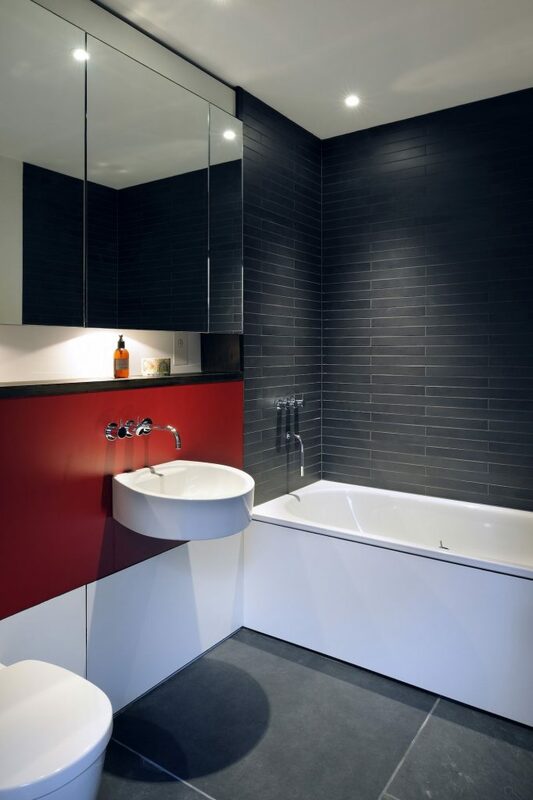 But just about every color is appearing in tiles this year as a bright, happy bathroom trend for color-lovers. 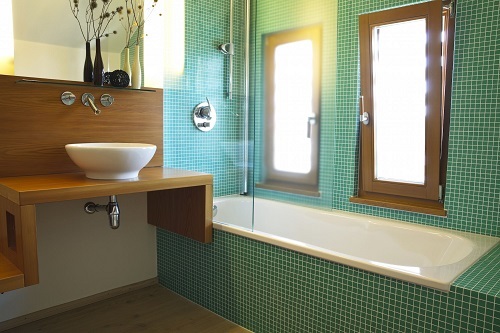 In this bathroom, vivid green is paired with more subdued natural elements (like the wood sink and window) for a balance of colorful and carefree style.